"Penthouse suite" redirects here. For the tune by Syd Dale, see The Penthouse Suite. For other uses, see Penthouse (disambiguation). 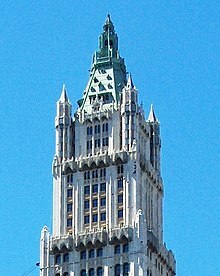 A seven-level penthouse under construction as of 2015 in the Woolworth Building in Lower Manhattan, once the tallest building in the world. A penthouse in the Opus Hong Kong became the most expensive apartment ever sold in Asia in 2015, at US$66 million. A penthouse apartment or a penthouse (coined through French appentier) is an apartment or unit on the highest floor of an apartment building, condominium, or hotel. Penthouses are typically differentiated from other apartments by luxury features. The term penthouse originally referred to, and sometimes still does refer to, a separate smaller "house" that was constructed on the roof of an apartment building. The idea of a penthouse apartment was born in the 1920s, called “The Roaring Twenties”, when economic growth brought a construction boom to New York City, the heart of the American economy. The high demand for living in urban areas and the wealth of Americans led to luxury apartments on the top floor or floors of buildings. One of the earliest penthouse apartments in the city was publisher Conde Nast’s duplex penthouse at 1040 Park Avenue. The original 1923 plan for the building provided three units on each floor with additional maids’ rooms on the roof, but in 1924, the building’s upper spaces were constructed to provide the grand duplex for Nast. Connected by a staircase to the rooftop entertaining salons, the corner unit at the top floor was redesigned to be private family quarters. The whole unit was decorated in the French manner by Elsie de Wolfe. Completed in 1925, Conde Nast’s duplex penthouse was used for many lavish parties, which were made famous as much by guest lists as by the entertainment. While European designers and architects long recognized the potential in creating living spaces that make use of rooftops and such setbacks, in US cities, exploitation of these spaces began in earnest in the 1920s. It was a matter of news when the development of a rooftop apartment at the Plaza Hotel overlooking Central Park was announced in 1923, and this was followed by rapid development of luxury penthouse apartments in the following years. 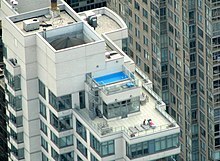 Penthouse apartment at the top of a building on the Upper West Side, New York City. When used as private outdoor terrace spaces, setbacks can allow for significantly larger and more protected spaces than cantilevered balconies. Due to the desirability of this outdoor space, buildings may be designed with such setbacks on more than one of its uppermost levels, to allow apartments on several levels to feature such terraces. Not all penthouses have such terraces, but they are a desired feature. One such space may be divided among several apartments, or one apartment may occupy an entire floor. A penthouse apartment/condominium may also provide occupants with private access to the roof space above the apartment, instead of, or in addition to, terrace space created by an adjacent setback. Penthouse apartments have not only the advantages of a regular apartment such as security and convenient location but also many of those of a house such as size and design. Similar to other city apartments, penthouses are usually located in the heart of urban centers yet offer a sense of being situated far away from or above noisy and crowded urban life. Such locations provide easy access to hotels, restaurants, malls, and schools. On the basis of their sometimes larger size, penthouses also generally overcome the issue of small space in regular apartments. Penthouses also differentiate themselves by luxurious amenities such as high-end appliances, finest materials fitting, luxurious flooring system, and more. Features not found in the majority of apartments in the building may include a private entrance or elevator, or higher/vaulted ceilings. In buildings consisting primarily of single level apartments, penthouse apartments may be distinguished by having two or more levels. They may also have such features as a terrace, fireplace, more floor area, oversized windows, multiple master suites, den/office space, jacuzzi, and more. They might be equipped with luxury kitchens featuring stainless steel appliances, granite counter-tops, breakfast bar/island, and more. Penthouse residents often have fine views of the city skyline. Access to a penthouse apartment is usually provided by a separate elevator. Residents can also access a number of building services, such as pickup and delivery of everything from dry cleaning to dinner; reservations to restaurants and events made by building staffers; and other concierge services. Set on a rooftop terrace, the penthouse has a view of the Midtown Manhattan skyline and at its feet is the whole geometry of Central Park. Penthouse ceiling was constructed to be thirteen and a half feet high. Windows were made to be as high and wide as they could be. Each section of the penthouse was furnished with unique materials. For the entrance gallery: marble floors and parchment panels framed in mahogany. For the library: Brazilian rosewood. For the dining room: Venetian stucco. For the master bedroom: reeded plaster. For the kitchen: Jaguar-green lacquer, bamboo, and textured glass. For the interiors of the fireplaces: long, narrow 19th-century bricks imported from France. This penthouse has a very sophisticated technology system. 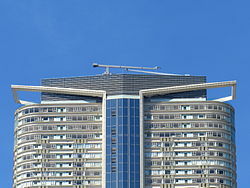 An anemometer was installed on the roof to measure wind speed so the terraces’ canvas awning can be retracted and does not get ripped off the penthouse’s exalted façade. Moisture sensors were used to detect a leak, automatically sending an e-mail to the building managers. Temperature sensors, strapped to pipes, send an e-mail when the temperature deviates by as little as a single degree from the temperature set by the client. Penthouse apartments are considered to be at the top of their markets, and are generally the most expensive, with expansive views, large living spaces, and top-of-the-line amenities. Accordingly, they are often associated with a luxury lifestyle. Publisher Bob Guccione named his magazine Penthouse, with the trademark phrase "Life on top". ^ Jessica Dailey (July 28, 2015). "Peek Inside the Woolworth Building's $110M Penthouse". Curbed New York. Retrieved March 5, 2016. ^ Georgia McCafferty (November 20, 2015). "Asia's most expensive apartment sells for $66 million". CNN Money. Retrieved March 5, 2016. ^ Alpern, Andrew. Luxury apartment houses of Manhattan: An Illustrated History. Dover Pubns, 1992.Print. ^ Aronson, Steven M. L. "Rooms with a view: inside and out, a New York penthouse attracts attention." Architectural digest. 67.4 (2010): 62-69. Print. 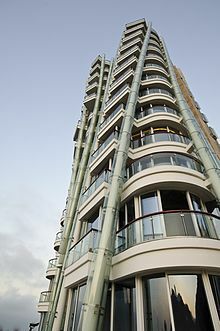 Wikimedia Commons has media related to Penthouses.